Clocks are provided in the test room. You may wear an analogue wristwatch, and any alarm or stopwatch features must be switched off. These will be the only items allowed on your desk during the test. Valuables such as wallets, keys and mobile phones may be placed under your desk during the test. Please note mobile phones must be switched off and placed face up under your desk. They must not be worn on your body and must not be accessed during the test. 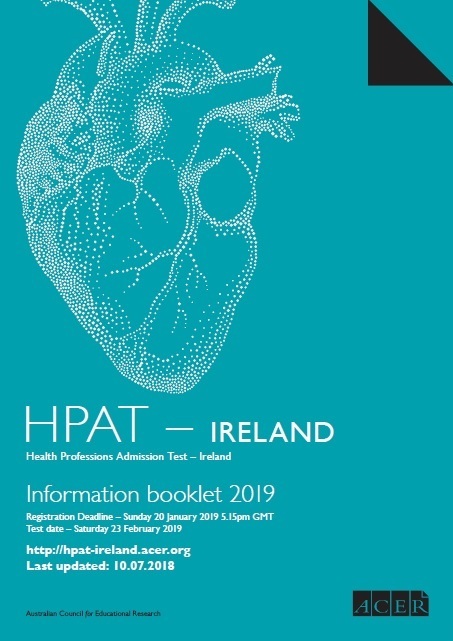 You are advised to bring only essential items, as neither the test centre nor the HPAT – Ireland Office can be held responsible for the security of your belongings. There will be limited space to store your bags and you will not be allowed to access your bags until the lunch break. Note: All other items, including but not limited to calculators, pagers, stopwatches, audio or recording devices of any kind, MP3 players, digital watches, Apple watches, dictionaries, note paper, pencil cases, highlighters, and rulers are not permitted. Access to food (including sweets and nuts), earplugs, medication or other medical equipment (e.g. support cushion) during the test will only be permitted due to a medical condition and can only be allowed if you have been granted special testing accommodations. It is recommended you have a good breakfast and take a snack to eat in the registration queue if you cannot wait until the end of the test. Please note large spaces like test centres can be difficult to heat/cool. To avoid being too cold or too hot, it is recommended to wear layers, which will allow you to adjust your own comfort level.